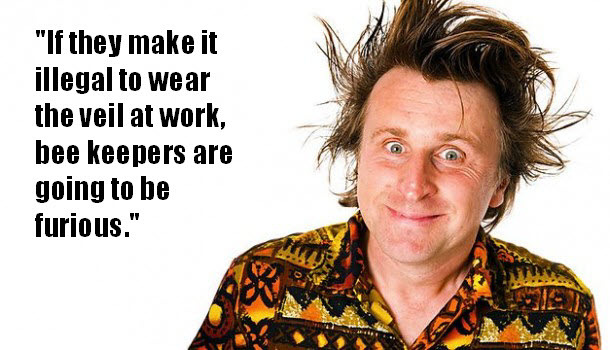 Without doubt a master of the one liner, throw in some crazy t-shirts and a very ‘quirky’ personality (well it appears so, not that I know him!) and you have a guy well worth watching. So here we go with a collection of very funny Milton Jones jokes, and below that some stand up vids. If they make it illegal to wear the veil at work, beekeepers are going to be furious. I don’t know if you’ve ever fallen asleep whilst eating a plate of cauliflower, and then woken up, and thought you were in the clouds. So I phoned up the spiritual leader of tibet, he sent me a large goat with a long neck, turns out I phoned dial a lama. Old ladies in wheelchairs with blankets over their legs, I don’t think so…retired mermaids. Incredible to think isn’t it, that every single Scotsman, started off as a scotch egg. Old and gingery. Sometimes I wonder what my grandfather would think of what I do, he spent his whole life in the kebab business, was buried with all his equipment, probably turning in his grave. Someone brought in a dead squirrel. Talk about bad luck. Nut allergy. The pollen count, now that’s a difficult job. Especially if you’ve got hay fever. I lost my job as a cricket commentator for saying “I don’t want to bore you with the details”. Militant feminists, I take my hat off to them, they don’t like that. I’m very English really. I even ordered a book on the internet, ‘how to have absolutely nothing to do with your neighbours’. Unfortunately I was out when it was delivered. Easiest job in the world of course, Australian psychiatrist, “Gday Gday how you doing no worries next”. About a month before he died, my grandfather, we covered his back full of lard – after that he went downhill very quickly. Here are some clips from his DVD called “Live Universe Tour – Part 1: Earth”. It is available to purchase now from lots of good retailers. Did you enjoy those one-liners? If so watch out for more as no doubt further releases will come from Milton in the future. Quite a few of his DVDs are available for sale now, perhaps even as a gift for someone you know. You can also catch him on Radio 4 and in TV appearances on things such as Mock The Week. Want to see Milton live on stage? You can see the current tickets for sale on the TicketMaster website. Well worth going to see him preform. Benidorm TV Series Clips – Top ITV Comedy! Really talented Comedian, very funny, his timing is brilliant! Wonderfully surreal and very creative. Yes, he’s great… But I always find him a little out of place on MTW. He has to rely on a fortunate cue, or maybe a round where they know he’ll be able to step up to the plate. It’s not really a criticism; his humour just isn’t comparable. I thought I was the only one who thought Mr. Jones is attractive! If I could, I would like ‘Hope Bateman’s’ comment. He is absolutely brilliant, his jokes are clean, clever and well executed. He is absolutely loony! But that’s probably why he stands out for me amongst other comedians, his adorable Hawaiian shirts, and let’s not forget his smouldering green eyes! I’m seeing him next year April in Hammersmith, and pray I meet him. Keep it up Milton! who picks up guide dog poo??? I’ve got a book coming out soon…shouldn’t have eaten it really. milton wen yoo kummin tay glezga canny wait by the way why do kamakazi pilots wear helmuts? I first watched Milton in an appearance on Mock The Week and, being a fan of surrealist humour, thought that he was absolutely hysterical! His rapier wit and masterful timing when it comes to delivery makes him one of the finest alternative comedians in Britain today although he may have to wait until everyone who’s done Monty Python dies before claiming the official mantle. I wanted to see him in Cardiff but missed out because the tickets sold out so rapidly – a testament to the great man’s remarkable talents indeed! An insatiable delight guaranteed to raise a grin amongst even the most miserable individuals. at last! a comedian who does’nt swear AND is funny! (like comedians of the past). keep it up Milton! enjoy watching (and laughing) you on ‘Mock the Week’. My sister has hay fever, she was recently diagnosed with diabetes, so i decided to cheer her up, you know flowers, chocolates..
What an amazing man. Have you ever laughed so much at one liner jokes? He’s my favourite comedian. I’m seriously loving the one liner thing! This page should be updated more! I wish it were possible to “like” Hope Bateman’s comment!